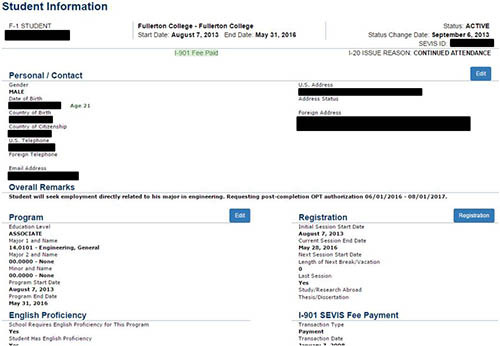 The Student and Exchange Visitor Information System (SEVIS) is used by schools, such as Fullerton College, who admit students with foreign citizenship. SEVIS is an online database that houses records for all F, M, and J visa students studying in the U.S. 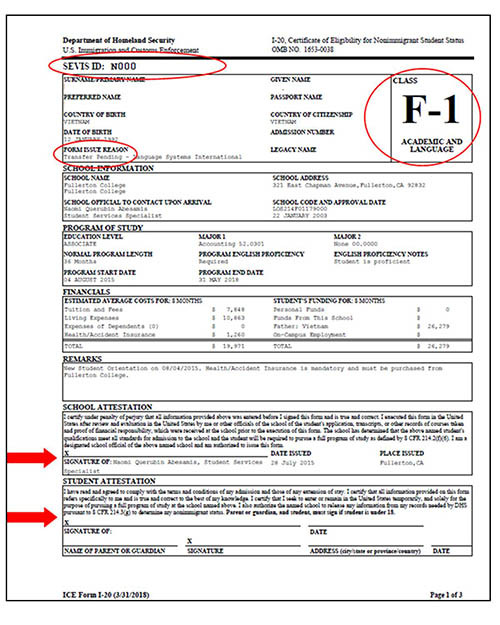 Issuing I-20 forms to F-1 students: the form I-20 is an official U.S. government form and is created by SEVIS with a unique SEVIS ID number. The I-20 acts as proof of acceptance to Fullerton College and contains the information that is needed to pay the SEVIS fee, apply for the F-1 visa or change of status, and admission into the United States. Maintain up-to-date records on the status of each student: PDSO and DSO will report changes in student records to verify status, authorize student employment, authorize reduced course loads or transfer student record to another institution. You must have a current, valid I-20 from Fullerton College as an F-1 or as a dependent of an F-1 student. You can request a replacement I-20 from the ISC if your I-20 is lost or damaged. For more information regarding your F-1 status, go to SEVP Student.